I received word about my secret Angel received her gift the other day. I am very happy that she liked the stuff I sent all the way to Australia. Visit her blog and read her comments. I got word from my Angel about her gift left Belgium the other day. I am waiting patiantly. Besides working on new patterns I have made this little makeup purse from a pattern that was a free gift from Fabrikkutsalget, Brumunddal at our annually Quilt meeting in March. Having a kitten in my house is a lot of fun. Zappa sems to love naps on the sofa. Here his is testing out the best sleeping positions. If you ask me, I don’t think this the most relaxing position I have seen. He have a basket to sleep in, but he has never slept in it! Exploring is his favorit thing to do! My sewing and knitting baskets is full of exciting things. And a lovely curtain to climb with all his 7 claws on each paw. After all this excitment Zappa needs a nap. This time he just fell asleep where he played!! Fun to see all the different ways to use Log Cabin. Small strips, wide strips, off center, crazy log cabin, different colour variations and combinations. One of our local quiltshops had brought some fabrics and sewingrelated stuff for sale. The shop have a good selection of Japanese fabrics. They also do long arm Quilting. This is a BOM they sell kits for. I have some work going on in my sewingroom. Yesterday I was sewing a lot. I finished a makeup purse from a kit. Also stitched nametag and roses for my Stitchers Angel. I’m also working on a pattern for a tabelrunner with stitchery blocks. As the evening light got poor and I realized I had to turn the lamps on, I diskovered a big Boo Boo. Today I have to undo to complete rows!Not fun at all. I might put it on my list for tomorrow instead. Say hello to Zappa! DS2 brought Zappa home from school last week. He and his classmates found 3 abandoned kitten in a ditch by the school. Zappa is a playfull and cuddly kitten. He is potty trained, can walk the steps to second floor and love tinfood. We have no idea of his age, but he is definitly not a wild cat. All his mannars tell us that he grew up in a house. He is a special cat too. He have 7 claws on each front paw and 5 on each back paw. Look at the big paws! Thank you to everyone who gave bids on the quilt I gave to the Pink Ribbon auction. Tusen takk til alle som ga bud på quilten jeg ga til Rosa Sløyfe auksjonen på QXL. 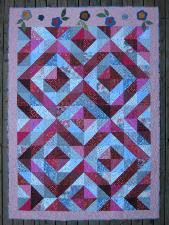 I have made this quilt to raise money for the Norwegian bransh of Pink Ribbon. Denne quilten har jeg laget for å samle inn penger til Rosa sløyfeaksjonen til Den Norske Kreftforening. Du kan lese mer her. To make bid at QXL click here. Har du lyst til å legge inn bud på QXL, klikk her. Quilten er sydd av meg og quiltet av Kikkis Systue. Vi vet begge litt om det å ha brystkreft.